Oh, a new Jewish music compilation album? Must be a day ending in Y. I have written previously about my love for compilation albums—twice, as a matter of fact. However, besides for the wedding album, there is another type of compilation album: the “nostalgia” album. The album that takes us back to a time long ago, to remind us of songs that we may have forgotten—the nostalgia album, if done correctly, can be a true work of art that give us insight into the mind of its producer as much as it gives us a refresher course in the music of times gone by. Song selection is vital on a nostalgia album. The producer or artist needs to decide what era he is going to focus on, if there is going to be a limit on how recent the songs can be, if he wants to be faithful to the originals or give the classics his own interpretation, and how many songs he wants to put in the collection. 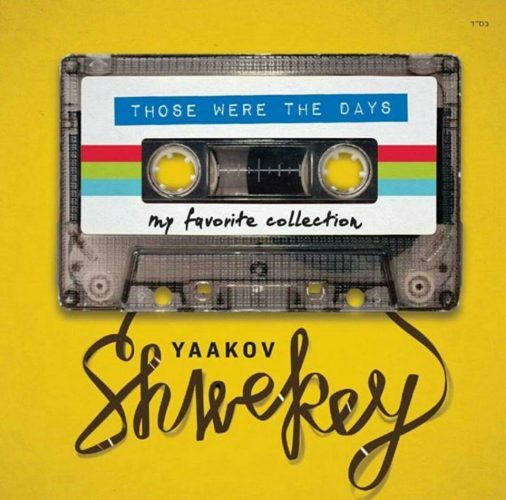 That brings us to Those Were the Days, the new throwback double-album release by Yaakov Shwekey. This album is nearly two hours’ worth of songs from the past, arranged by theme into eight medleys of approximately 15 minutes each. TWTD was produced by Shwekey and Yitzy Waldner, and they hit almost all of the correct marks in a project that was obviously a labor of love. No one was forcing Shwekey to come out with an album right now—it’s been less than a year since the release of We Are a Miracle. It’s not like 15 years ago, when he had to put out Shwekey B’Simcha and Shwekey B’Hisorerus in order to remain relevant in an increasingly crowded market. But Shwekey is at the point in his career where he can do whatever he wants musically, and if he wants to release an album of old songs, I’m not going to be the one to stop him. A quick thought about the album art before I get to the album itself. When the album was announced on Facebook, one fan was so thrown off by the cover that he commented “but I don’t have a cassette player anymore!”, apparently not realizing that it was an album of music that had (mostly) originally come out on cassette, not a new cassette album. And speaking of cassettes, the album art looks like it may or may not have been inspired by the Guardians of the Galaxy soundtrack. One of the things I like about Those Were the Days is the fact that it’s a legitimate nostalgia album, in that out of the 63 (!) songs on the album, only eight of them were released this century—and seven of those are in the Shwekey medley. Sometimes, what seems to be a “classics” album ends up being an “instant classics” collection (I’m looking at you, Shimmy Engel. You too, Meshorerim Choir. Songs that were released in 2014 don’t go in a collection called “Classics” in 2015), which thankfully didn’t happen here. The collection skews slow—there is no disco/rock medley on this album—so you won’t be queuing up and tracks from TWTD for a dance set at your next DJ gig. However, there are some upbeat selections which help the album mostly avoid the trap of sounding traditional at the expense of feeling dirge-y. Track 1, “Carlebach Medley” (arranged by Avrumi Berko): Full disclosure: I am incapable of listening to R’ Shlomo Carlebach’s recordings for any length of time. I will always acknowledge his place on the Mount Rushmore of Jewish composers (along with Abie Rotenberg, Yossi Green, and possibly Yitzy Waldner—but that’s a conversation for a different article), but there is something about his style (and that of his imitators) that I just can’t handle. However, I am more than capable of listening to his songs being sung by other people—including Yaakov’s 10-song medley here. Unlike, say, Shlomo Simcha’s Fusion album (which I loved), Shwekey delivers a mostly straight-up rendition of some favorites, including “Esa Einai”, “Ana Hashem”, and “Simcha L’artzeicha”—plus “Zol Shoin Zein”, which was recorded by R’ Shlomo and composed by R’ Eliyahu Hartman. Track 2, “Shwekey Medley” (arranged by Ravid Kashti): This medley could have been risky for Yaakov to put on this album. On one hand, he couldn’t possibly expect people to pay $18 for yet another rendition of “V’hi She’amdah” and “Mama Rochel” (I have at least five different V’hi She’amdah recordings in my collection), but he can’t completely ignore his hits either. I think he found a good balance on this track. The medley begins with an old recording of 11-year-old Yaakov singing Yossi Green’s “Kol Berama”, and kudos to Yaakov and Yitzy for leaving the track in its unadorned original glory and not running it through Auto-Tune (you see, the stars really are just like us!). The rest of the track is made up of songs from Shwekey’s older albums that are off of the beaten path: “Lech Ami” from Shwekey 2, “B’ni” from Shomati, “V’haarev Na” from Yedid. “V’hi She’amdah” and “Mama Rochel” each make an appearance, but only a few bars of each, and only instrumental. Good call. Track 4, “MBD Medley” (arranged by Rafi Greidi): In this set, Shwekey showcases 10 old-to-medium-school hits from the Undisputed King of Jewish Music. The medley includes a Yiddish song (“Pharaoh in Mitzrayim”), English songs (“Pray and Sing”), Ivrit songs (“Shir Hashalom”), and Yossi Green classics (“Od Yeshvu” and a lovely jazzy rendition of “Daagah Minayin”). The set also includes “B’ein Meilitz Yosher”, which is one of my favorite Yom Kippur songs, and “Va’anachnu Lo Neida”, and out-of-left-field number off MBD’S second album, Neshama. The set ends off with “Let My People Go”, which is where I am making my protest. When Let My People Go came out in 1985, its title song was controversial because of its first stanza: “Many years alone in his cell, / Awaiting redemption so faithfully, / A prisoner of conscience, serving in hell, / Yearning for home and destiny.” At the time, the reaction was something along the lines of “OMG I just heard MBD use a bad word”. The reason why I quoted those lines in full is because Shwekey left them out. Now I’m not a producer or a decision maker on any kind of musical project, but I would have left off the song entirely instead of just starting with, “His commitment to Heaven’s been made….” He could have easily put in “Yerushalayim Is Not for Sale” and no one would have been the wiser. Either play the song or don’t play the song, don’t do it halfway. Track 5, “Middle Eastern Medley” (arranged by Rafi Greidi): By this point in the album, you might be forgiven for forgetting that you were listening to the same artist that had brought you Libi Bamizrach and Kolot. But Shwekey brings us back East quickly with this track, a medley of seven old-school nigunim of the Edot HaMizrach tradition. Being a full-blooded Litvak, I was only familiar with a few of these songs. I knew “Dror Yikra” and “Laner v’Libisamim” from multiple sources, and Yehuda Glantz recorded a version of “Ki Eshmera Shabbat”. This is the most upbeat track on the album, switching from debka to hora and back again over the course of the set. Track 6, “Journeys Medley” (arranged by Ravid Kashti): Shwekey does serious justice to my favorite composer with this epic track. It begins with “It Had to Be Hashem” from Journeys 1, a great execution of what I found to be an interesting choice because it contains some of Abie’s weakest lyrical work (“Who made the oceans and the fish, / Candy bars and licorice?” Really? ), and gets better from there. Shwekey’s “It’s Time to Say ‘Good Shabbos’” is as good of a version of the song as I have ever heard. Then he treats us to Abie’s tributes to faith (“Little Kite”, Journeys 2) and friendship (“Joe DiMaggio’s Card”, Journeys 3), before the music turns darker around 10 minutes in. That’s when Shwekey hits us with the one-two Holocaust punch: “Memories” followed immediately by the chorus of “The Man from Vilna”—yes, it’s as emotionally draining as you would imagine. Finally, the track ends off with a rousing rendition the song that inspired the title “Journeys” to begin with: “There’s No Place Like Home”, the song about the Jewish search for truth performed by Moshe Yess on Journeys 1. Amazing. Track 7, “Classic Medley” (arranged by Avrumi Berko): A name for this track that didn’t make it past the committee: “Really Yeshivish and Chassidish Kumzitz Songs”. These are the songs that every chazzan you know keeps in their back pockets to use during davening, that the guy behind you in the beis medrash of questionable singing ability belts out during second seder, and that camp choirs trot out every couple of years when they are searching for an oldie but goodie. There are six songs in this track, all of which are classics in their own right—including Shlomo Simcha’s “Machnisei Rachamim”, R’ Aharon of Karlin’s “Kah Echsof”, and “Chamol”, composed by Akiva Homnick and most popularly recorded by Shloime Dachs. Track 8, “Dveykus Medley” (arranged by Rafi Greidi): For the last track on the album, the kumzitz gets a little less yeshivish, and we are treated to a selection from Abie Rotenberg’s other legendary group, with updated arrangements and a fabulous lead vocal. Shwekey’s soaring vocals (and Zemiros Group’s backup talents) take the old standards like “Lev Tahor” and “Kol B’Rama” to a whole new level. The album ends off with a rocked-up version of “Shalom Rav”, which is sadly missing the sax solo from the original. When it comes to buying a compilation album, the purchase becomes a value proposition—can I get something on this album which I can’t get from the originals? In the case of Those Were the Days, I believe the answer is yes, if for no other reason that one of the best Jewish singers of the last fifty years is the performer. TWTD is a great and fitting tribute to the previous generations of Jewish composers and artists, and I think it’s well worth the investment. Great job, Shimon! I’m having a hard time coming up with something to argue with ;) BTW, Shwekey mentioned on Layl Shishi with Yoely Karr (a great interview BTW, you can find it here: http://jrootradio.com/shows/layel-shishi/ ) that he specifically chose songs that were a bit overlooked for his set & threw in a piece of Vehi Sheomdoh & Shema just for good measure.